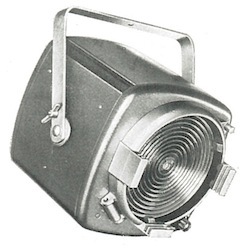 A type of lantern which produces an even, soft-edged beam of light through a Fresnel lens. The lens is a series of stepped concentric circles on the front and pebbled on the back and is named after its French inventor, Augustin Jean Fresnel (1788-1827). He developed the lens for French lighthouses so that they could be seen further out to sea and could achieve a longer focal length with a lot less glass than a standard plano-convex lens. In celebration of the UNESCO International Year of Light and the 200th anniversary of Augustin-Jean Fresnel’s wave theory, the Society of Light and Lighting organised the Fresnel Lecture, with sponsorship from Philips, along with the IALD and the STLD. During the lecture, Peter Phillipson MSLL reappraised the life and work of Fresnel, along with guest appearances, artifacts and experiments. Any undated equipment is listed first with a grey background. If you can help us by adding dates please Contact Us! This archive is still under construction, so please bear with us while we add more items. If you have specific information or documents that we don't have, and would be willing to share, please contact us!